Our little Lucy turned 2 years old a couple weeks ago and we had a fun Little Mermaid themed "shellabration"! I loved putting it together and most of the decor was super cheap and easy to put together! These cupcakes were so much fun to make! I used a candy mold to make the shells, Sixlet "pearls" and Wilton Shimmer spray to create a pearlescent effect. 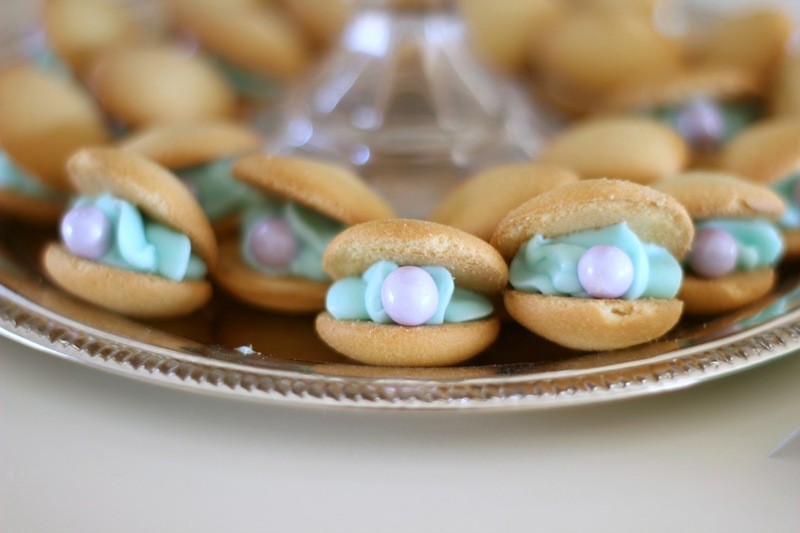 The cookies were just two vanilla wafers with frosting in the middle, finished off with a pearl! Aren't these sandwiches so fun? I glued googly eyes to toothpicks and stuck them into small croissants from Sam's to make crabs. Fish n' Chips is pretty self-explanatory and then the punch was a simple one: 1 gallon lemonade, 1 gallon blue Hawaiian punch. Done! Some plain green crepe and a few fish I drew and cut out of leftover scrapbook paper added a nautical touch to the bar where the food was being displayed. The backdrop is probably one of my favorite parts of the party! It was just cheap color-coordinated tablecloths from Party City that we taped to the wall in front of some regular Christmas lights. Then I added paper fans made with scrapbook paper to the top for a little something extra. I also printed out a quick sign for the gift table. I have been dying to make a tissue tassel garland for so long and I am so glad I did! It turned out so cute and I love the addition of the Happy Birthday banner ($1 in the Target Dollar Spot)! The centerpiece got thrown together last minute when I decided my table looked naked. I pulled the print from a frame in Lucy's gallery wall and propped it on my cookbook stand. A few quick tissue pom poms and a few stray party beads and we had a centerpiece! We hired an actress from Enchanted Events here in St Louis to play Ariel and I can't tell you how amazing it was! She did a fantastic job and Lucy was in absolute awe! I was tearing up watching her little eyes light up and she spent the entire rest of the day looking for Ariel around the house! So precious and worth every penny! Bubble wands made the perfect favor for kids of all ages and were super cheap: $1 for a 6 pack at Walmart! Woohoo! P.S. Our party was featured on Project Nursery! Go check it out here! So I want to know: do you go big for your child's birthday? Do you prefer to DIY your decor or buy it premade? This is the cutest theme! I LOVE all the fun touches with the food! Those cupcakes look delish + gorgeous! Oh my goodness! This is amazing!! I love all the details that went into your decor and the food!!! This is the most adorable little party ever. You did a fantastic job. You should be a party planner. Can you share the template for the invitations? It would be perfect for our daughters 1st bday. I'm sorry I don't have a template, I drew and cut out each shell and designed the text to fit on Microsoft Word. Where did you find the "look at this stuff" print out? It is handmade. It should be easy to recreate with Microsoft word or a photo editing site. Best of luck!